Paris, the “City of Lights”, and it was the Antwerp Diamonds team of Audrey Coulter and Harrie Smolders who shone brightest of all in the 10th round of the Global Champions League. 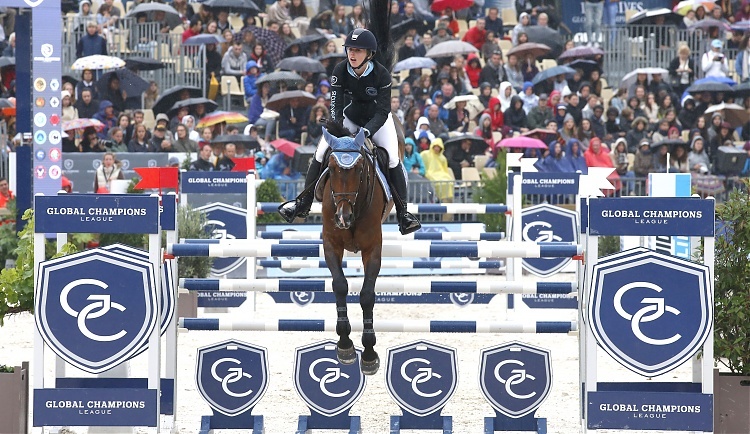 The final competition for the three day festival of show jumping in the French capital was met with cloudier skies, however no amount of rain could dampen the enthusiasm of the phenomenal crowd who cheered the riders on throughout the 200,000 euro prize class. It was a battle of the best, with the overall GCL Ranking leaderboard changing dramatically at every round. Rocketing to the top after yet another podium, Valkenswaard United currently sit in the lead with a tally of 239 points. Breathing down their necks are former leaders Monaco Aces, an intense three points behind, and Antwerp Diamonds have closed the gap to the top two, currently sitting in third with 226 points overall. Among guests watching the thrilling GCL team competition this afternoon were Antwerp Diamonds’ star Audrey Coulter’s parents Jim and Penny and her siblings. The delighted family members saw Audrey clinch victory, with a stunning clear round under intense pressure, in the high stakes competition. International guests watch the contest from the beautiful VIP Lounge where business leaders, politicians and sports stars enjoyed the ringside action. Looking to benefit from the enthusiastic French crowd were the home team the Paris Jets, this weekend fielding Olympic medallist Rolf-Göran Bengtsson and young Belgian talent Olivier Philippaerts. Fresh from his LGCT Grand Prix win the day before, Rolf posted a beautiful clear with his expressive grey stallion Clarimo ASK around the up-to-height 1.55m, first round course. The home team delivered, picking up just 4 penalties to assure their place in round two. With the standard of horse and rider so high amongst the 12 teams, any more than one pole down between riders eliminated some of the teams, with the likes of Vienna Eagles and Cascais Charms unable to qualify for the next phase of the competition. There was a nervous moment for Cannes Stars after Bosty lost balance pushing for the final fence, however he was able to stick like glue to Sunshine du Phare, putting himself and teammate Marco Kutscher safely into the mix. Crucially amongst the eight teams heading into the second round were the top two contendors in the overall League rankings, Monaco Aces and Valkenswaard United. Both took centre stage for round two on 4 penalties each, vying for position at the exhilarating event. Three teams went through on a score of zero faults - the Rome Gladiators who this weekend fielded Marlon Zanotelli and the speedy Laura Renwick, the Antwerp Diamonds and the Cannes Stars. Of the teams on zero scores, Harrie Smolders and Capital Colnardo for the Antwerp Diamonds posted another clear to move them into pole position with the final riders still to come. They had little breathing space however with the Cannes Stars just 1 penalty behind and another three teams on four faults overall. It was tight ahead of the last 8 riders, and the pressure mounted on those last to go. A uncharacteristic pole for Maikel van der Vleuten and VDL Groep Quatro dropped the League leaders, Monaco Aces to 6th. Valkenswaard United’s John Whitaker put yet more pressure on the following riders with a smooth clear on his talented bay mare Ornellaia, with team mate Alberto Zorzi and Fair Light van T Heike jumping clear in round two. Their four faults carried through left them with a score of four overall, and the ones to beat as the final riders entered the ring. Crowd favourite and home hero Roger-Yves Bost bettered that score with just the one time fault to leave the Cannes stars on a final score of two faults overall. A clear, or just one time fault was needed for the win, and the tension was electric as Audrey Coulter of the Antwerp Diamonds entered the arena with her brilliant horse Alex. Watched on by teammate Harrie and her family, the young American held her nerve, riding a class round to jump clear, putting the team on the top step and winning the Global Champions League of Paris. The pair enjoyed their moment on the podium as the only team to keep a clean sheet on this leg of the League, and the win moved Antwerp Diamonds up one place to 3rd in the overall rankings. Cannes Stars moved up to 5th whilst Valkenswaard United's 3rd place finish in Paris moved them to the top of the League. The blue, white and orange team are now three points clear of Monaco Aces with five legs remaining, including their home event in The Netherlands in August. Next stop, and the Global Champions League heads south to Portugal as the battle for the Championship title gallops into its final third. Audrey Coulter, Antwerp Diamonds: “It’s been a super fun class. Harrie and Jos have been amazing teammates. It’s nice to have some top horses who we can put in this class and go and win. Harrie rode one of my horses - he jumped well yesterday, and we really wanted to pull out a win. Harrie’s ridden Colorado a few times before, so he knows him so I had a lot of faith in them. We started the season with me first and Harrie second but Alex is very fast so we decided mid-way to switch and put me second. That way I would know what I would have to do if we needed to go for time." Harrie Smolders, Antwerp Diamonds: “This class suits us very well. I know Audrey’s horses very well, we train well together and this plays to our strengths. Today showed it again - Colorado is a horse of exceptional class so it wasn’t so difficult! I haven’t had the phone call from our teammates yet, but for sure they were watching everything." Marco Kutscher, Cannes Stars: “First of all congratulations to the winning team. We are both very pleased with our second place - our tactic is quite simple, we both have slow horses who are very careful. We’re still waiting to win this class on one time fault!" John Whitaker, Valkenswaard United: "We were very good. We had an unlucky fence first round but great second round and we're pleased to be up there and on the podium. We are leading [the overall rankings] and it is really good. It is very close and we’ll keep going and try to stay in the lead to the end. We know we have to jump clear and go fast."